2017 was a very tough year due to so many unfavorable business climate and difficulties for our products. Sales were unprecedently slow till end of 3rd Quarter. Fortunately, in 4th Quarter especially in December we returned to significant profit level due to big deliveries to two big Universities and Mining Industries. This helps us highest ever year end cash in hand. All our Four business lines equally contributed in 2017 from Ten Agencies . We thank to all our staff, customers and principals. We believe 2018 should not be as difficult as 2017 as our country's and world's economy looks better and exchange rate is stable. 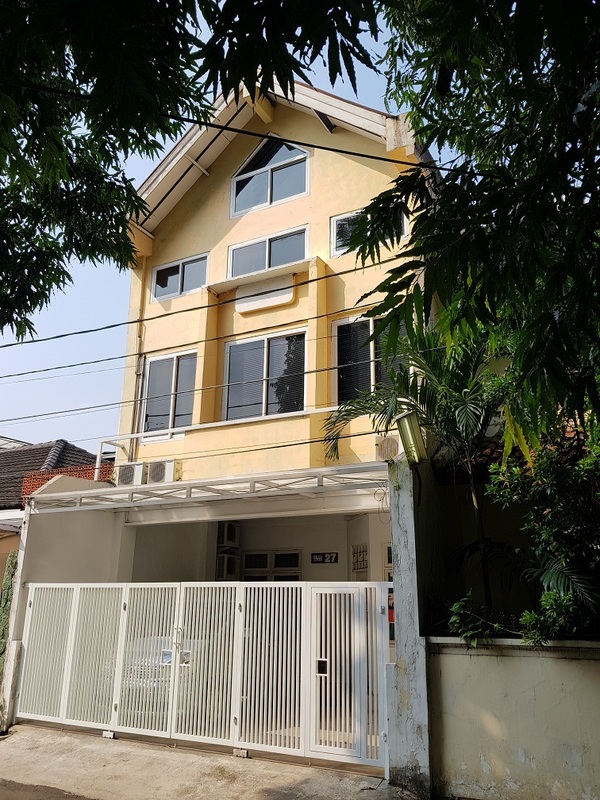 We are proud to mention that our main activities successfully taking place for over three years now from our "own" elegant 200 sq meter 3 storey building on our "own" land (Click here to see First Floor, Second Floor). More new IT facilities are installed in 2017 in our new building. Our Show Room at Gedung Gajah continue to remain with more demo stocks and activities. Being operated from our own new building we can control and save operation costs to stay competitive in the tight market. Two new staff who joined us in 2016 are satisfactorily productive. We plan to add four more staff in 2018/19. Our newly added IDEX Health and Science and Cole-Parmer because of ISMATEC acquisitions in 2016 are now showing signs of picking up. Both IDEX and Cole-Parmer are well known, big names in Lab and Analytical markets and we believe to achieve higher sales growth with them. Because of our extensive knowledge in Alibre/Geomagic and Materialise 3D Softwares and 3D Printing we have opened up in January 2016 "Ready Made 3D Design for 3D Printers" internet sales for international markets. Our internet showcase is already filled up with more than 80 high quality engineering and arts designs for 3D Printing. 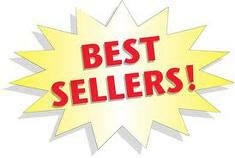 Our online sales via well known online shops also show growing results. All our company dedicated staff built again higher technical skills in their careers, live in a decent life with their families and give good education to their children. Company covers theirs and familes' health insurance. We all believe loyalty, hard work, discipline and patience are keys to success and always pay back. "As always our objective is to build a "bridge" between our customers and our manufacturers and to give our unique added service to all of you". "As always we only handle world's reputable, reliable and high quality brands and products"
We, Siberhegindo is NO. 1 Pipette & Automatic Liquid Sampling Systems supplier in Indonesia equipped with complete stocks, complete spare parts, service and calibration facilities. 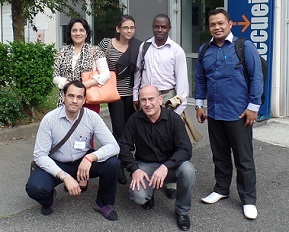 Our sales staff and technicians are trained by Gilson in France. No other pipette supplier can provide you similar service that we are providing to you. On top of that GILSON pipettes are the "BEST, STRONGEST and MOST ACCURATE" in the world. Call us today, we will deliver from our "Ready Stock" any types of Gilson Pipettes & Tips in 2 (two) hours time in Jakarta. 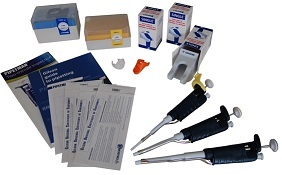 Call us immediately if you want to replace spare parts and calibrate your pipettes, we will come and collect your old pipettes and let you use our Gilson Pipettes during repair. 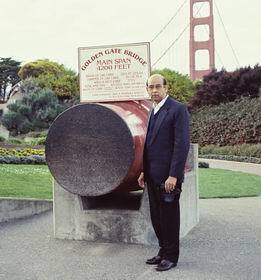 during a business trip to USA. 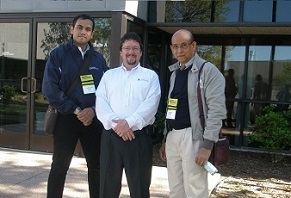 Laser Technology Inc. President Mr. Eric A. Miller (center) together with Ommar Win and Mr. Win at the Traffic Safety Meeting at the LTI Head Quarter in Denver, Colorado, USA on 26-29th April 2015. 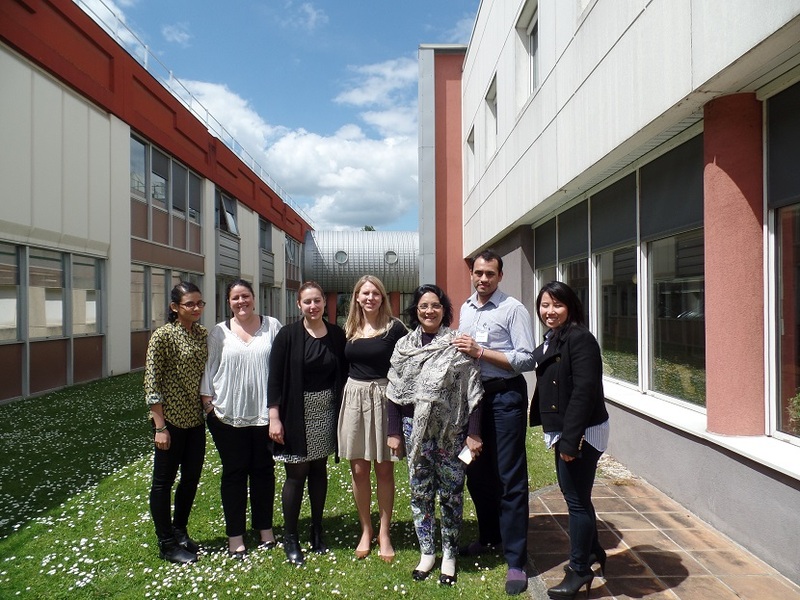 Siberhegindo Manual Liquid Handling Team members (From Front Left) Ommar Win, Aris Haryanto, Sandra Win, Farida Win together with Gilson SAS Senior Instructor Fredrik Faye (Front Sitting Right) at the Gilson SAS factory in Paris, France during MLH New Products Application and Service Training on 18-21 May 2015. Our ready stock Lauda RA-8 Cooling Thermostat was sold out on 11 December 2018 to a company located in Bekasi. We only have one set of Alpha A Immersion Thermostat left now. Siberhegindo Teknik sold many Lauda, Germany made Alpha Heating Thermostat and Ecoline/Proline Cooling Thermostat with complete systems which are widely used by Indonesian Manufacturing Companies mainly because of high quality with reasonable prices. Several units are still functioning well even after 10 years continuous uses. Please call Mr. Win directly if you want to place order today at following discounted price of our last stock. 1 x Alpha RA 8 Cooling Thermostats "SOLD OUT"
We received again Sherwood Flame Photometer M410 parts & consumables order on 14 December 2018. Our ready stock Flame Photometer M 410 complete with Compressor, BlueNotes Software and Printer is also now ready for delivery. Because of growing number of M 410, following are ready stock of consumables for Flame Photometer updated almost everyday. We also provide one full day FREE Installation & Application training at our office in Jakarta to all our customers. 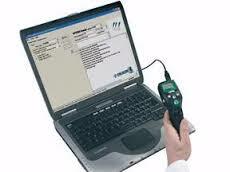 We also provide "Calibration Certificates". Sherwood Scientific (UK) manufactures: Flame Photometer, Colorimeter, Fluid Bed Dryer, Magnetic Susceptibility Balance, Microwelder, Chloride Analysers. Please call our Ms Farida Win or Mr. 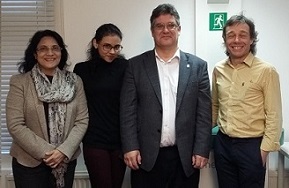 Win who were all trained in Sherwood Scientific in United Kingdom, for more technical details. On 27th November we received order for 20 (twenty) pieces of Gilson Fixed Volume Pipettes just from single customer to be used in an overseas funded project in Pekanbaru and Jayapura. Next to conventional fixed volume Pipette, Gilson now introduced Pipetman L fixed volume which has a clamp to stabalize the fixed positions. PIPETMAN® Fixed is a fixed-volume, air-displacement pipette that offers exceptional accuracy and reliability. Fourteen models are available covering a large volume range from 2 μL to 5000 μL. The volume is easily adjustable for dense or viscous fluids (once reset, the new volume cannot be changed accidently). 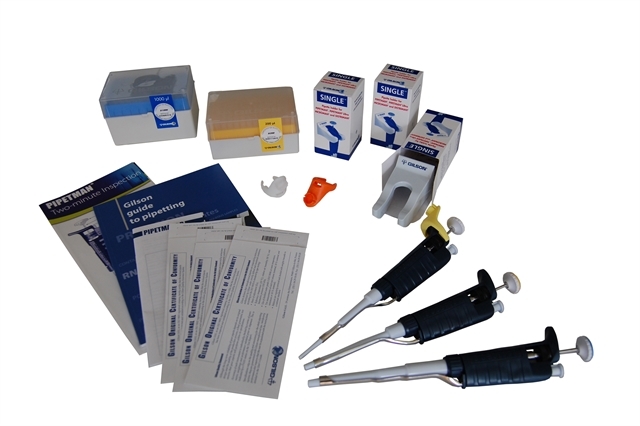 With a single volume mechanism, PIPETMAN Fixed is a reliable and economical choice for clinical diagnostics, quality control, and routine testing. Please call our Ms. Farida Win, Mr. Aris Haryanto or Mr. Ommar Win who were all well trained in Gilson SAS in France for more technical details and to see Demo units. 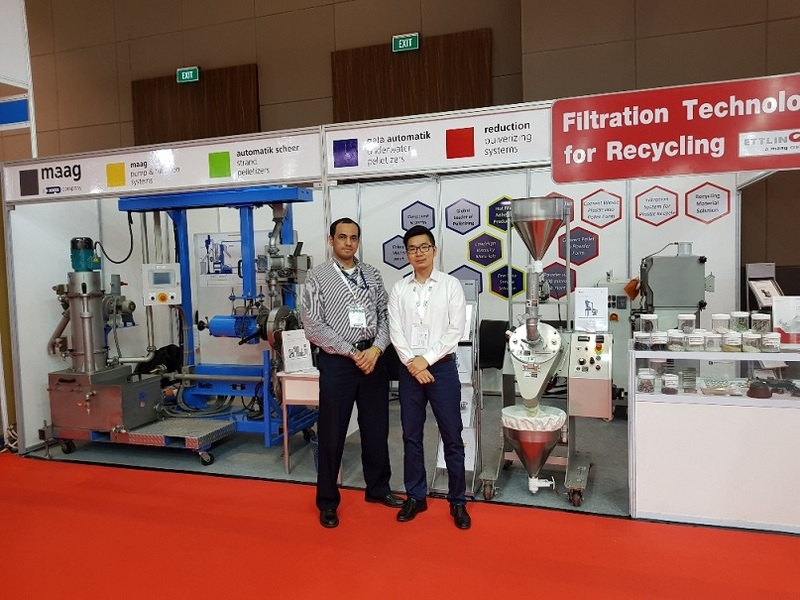 MAAG PUMP SYSTEMS is taking part at the Plastic & Rubber Exhibition on 14 – 17 November 2018 under Booth No. B3-5015 at the PRJ, Kemayoran, Jakarta. We kindly invite you and your team to visit and meet our MAAG Asia team and to see our newest products. MAAG Group now possess complete product lines for Polymer, Extrusion, Compounding, Filtration and Recycling Industries. Recently ETTLINGER from Germany becomes member of MAAG group. Please come and meet our product specialist from Germany, Singapore, Malaysia and of course from Indonesian Representatives. Please call Mr. Win directly or Ommar Win if you want to know more about Maag Pump Systems and overall products. 90% of Indonesian polymer and extrusion industries use only Maag Pumps because of MAAG PUMP SYSTEMS superior quality and Siberhegindo's unique local 24/7 technical supports). We delivered 10 Pack (6 pcs/pack) of Tygon CA 2-Stop ID 0.76 to our routine customer in Surabaya on 15th November 2018. We also delivered 10 Pack (12 pcs per Pack) of YELLOW Tubings to our routine customers in Medan on 24th September 2018. Our new stocks of tubing also arrived on 21st September 2018 from USA. Due to growing number of Ismatec Peristaltic Pumps in Indonesia and growing requirement of Tubing we keep ready stock of most often needed tubings. Ismatec IPC pumps come in 4,8,12, 16 or 24 channels and correct size and materials of tubings are essential for all users. We also keep Ready Stock IPC -16 in 2018. Please call Ms. Farida Win, who has been trained by Ismatec in Europe for more details. Siberhegindo now can supply IPC-16 together with LabVIEW Software and Connection Cables to PC. We sold first Motorized Pipetman P5000M on 15th October 2018. We keep "READY STOCK" Gilson Electronic Pipetman new stocks new stocks since 12th September 2016 as follow, including Free Gifts for Motorized/Electronic Pipetman owners and buyers. If you are one of them, please call Ms. Farida, Mr. Aris or Mr. Ommar to send the free gifts. Also, please call us today. if you want to see DEMO UNITS and how it works with Software. We will guide you how to use Pipetman M with Software. 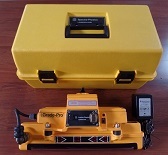 We received order on 20th July 2018 from a prestigious university in Bandung for Sherwood Scientific UK made Magnetic Susceptibility Balance type MSB MK-1. 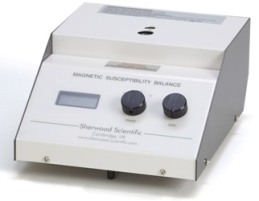 Sherwood Scientific's Magnetic Susceptibility Balances are recognised in hundreds of teaching and research laboratories throughout the world. Based on a design by the Late Professor Evans of Imperial College London they offer a number of significant advantages over traditional methods. The Mk1 balance adheres closely to Evan's original design. The new Magnetic Susceptibility Balance - AUTO is a microprocessor controlled, state of the art balance for detecting the magnetic properties of gases, liquids and solids. 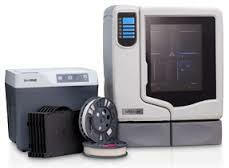 The improved sensitivity, versatility and overall performance make it ideally suited for new analytical applications in the research laboratory and industrial quality control. Sherwood Scientific (UK) manufactures: Flame Photometer, Colorimeter, Fluid Bed Dryer, Magnetic Susceptibility Balance, Microwelder, Chloride Analysers. Please call our Ms Farida Win who was trained in Sherwood Scientific in United Kingdom, for more technical details. If you are "End User" and bought Sherwood Scientific M-410 Flame Photometer from Siberhegindo directly or via Sub-Dealers, please contact us by indicating Serial No. of unit. We have surprise "DOOR PRIZES" for you. This offer is valid from 1 July to 31 December 2018 only. Jika anda "End User" dan membeli Sherwood Scientific M-410 Flame Photometer dari Siberhegindo secara langsung atau melalui Sub-Dealer, silakan hubungi kami dengan menunjukkan nomor Seri unit. Kami memiliki kejutan "DOOR PRIZES" untuk anda. Penawaran ini berlaku dari 1 July hingga 31 December saja. For Sherwood M-410 Flame Photometer End Users. We achieved another "highest" month of sales on 21st May 2018 for 30 units of Gilson Pipettes just from one single customer plus 20 units pipettes and bulk of Tips from other 17 customers in one month alone. Pipetman G is the "Best Seller". Another "Outstanding" month. Thanks to our loyal customers and our Gilson Sales Team. As big portion of stocks were sold out and delivered we replanish new stocks including all types of pipettes and various types of Tips in May which will arrive in June/July 2018. It is again the biggest stock ever that we ordered in 2018 for our loyal customers. Please see our Updated Ready Stock for your reference within June/July 2018. Please call our Ms. Farida Win, Mr. Aris Haryanto or Mr. Ommar Win who were all well trained in Gilson SAS in France for more technical details. We received order for Fisher Lab Leak Detector XLT-30 on 15th May 2018 to a multi-national construction company. XLT-30 is an accurate and strong unit sold at reasonable price and suitable to use in rough conditions in the fields. There are already many units already been used in Indonesia successfully. Since our existing stocks are all sold out, we will add new stock since April 2018 including our best seller TW-82. New stock arrives every month. Buy before you get late. We received Purchase Orders for 10 Tygon each from our routine customers from Medan and Surabaya on 27th April and 2nd May respectively. Our new stocks of tubing also arrived on 26th April 2018 from USA. Due to growing number of Ismatec Peristaltic Pumps in Indonesia and requirement of Tubing we keep ready stock of most often neededeach from our routine customers tubings. IPC pumps come in 4,8,12, 16 or 24 channels and correct size and materials of tubings are essential for all users. On 28 February 2018 to a Mining Company via PT. Bensra Sukses in Riau. On 19 April 2018 to a Coal Mining Company via PT. Multiprima Abadi also in Riau. Please call our Mr. Tri Wardhana or Ommar Win for more details and to see following Demo units as of January 8th, 2018. Please call Ommar Win and come and see following ready stocks at our show room and buy straight away. It is cheap, safe and easy to use. We received order for Fisher Lab Leak Detector XLT-17 on 9th April 2018 to a multi-national construction company. XLT-17 is an accurate and strong unit sold at reasonable price and suitable to use in rough conditions in the fields. There are already many units already been usesd in Indonesia successfully. Since our existing stocks are all sold out, we will add new stock in April 2018 including our best seller TW-82. New stock arrives every month. Buy before you get late. We delivered 10 Tygon on 09th February 2018 to our routine customer in Medan. Due to growing number of Ismatec Peristaltic Pumps in Indonesia and requirement of Tubings we keep ready stock of most often needed tubings. IPC pumps come in 4,8,12, 16 or 24 channels and correct size of tubings are essential for all users. We achieved highest beginning month of sales in January 2018 for Gilson Pipettes and Tips. 44 Pipette were sold in one month alone mainly Fixed Volume, Microman and Microman E and Neo. Also many Tips including Capilary Piston CP. New stocks including all types of pipettes and container load of various types of Tips will arrive in February 2018. It is the biggest one month stock ever that we ordered in 2017-2018. Please see our Updated Ready Stock for your reference by end February 2018. Please call our Ms. Farida Win, Mr. Aris Haryanto or Mr. Ommar Win who were all trained in Gilson SAS in France for more technical details. We delivered on 21st November 2017 Oil in Water Monitor Systems OMD-24 Computer Unit to an Indonesia customer. We also delivered on 28th June 2017, OMD-24 Measuring Unit to Target Mega Marine Sdn Bhd in Kota Kinabalu Sabah, Malaysia. 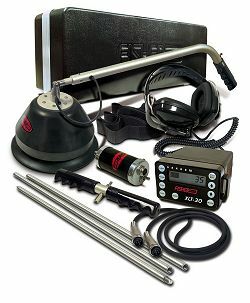 The OMD-24 Bilge Alarm Unit has been designed specifically for use in conjunction with 15 ppm oil-water separator units and has a specification and performance which exceeds the requirements of the International Maritime Organization specifications for 15ppm Bilge Alarms contained in Resolution MEPC. 107 (49). All new units comes with new certificates from Deckma-Hamburg, Germany. Please call Mr. Win or Ommar Win today to obtain more technical informations, quotations and delivery status. On 15th November 2017 we received another 19 sets of Pipetman G Single from a prestigious Private Medical University located in Jakarta. Gilson Pipetman G which was launched over a year ago by Gilson France become popular in a short span of time. PIPETMAN G offers you one of the lowest pipetting forces on the market thanks to a new easy glide piston displacement that gives ideal pipetting and purge sensations. Please see our Updated Ready Stock for your reference. We add new stocks every month. We are proud to announce that we won a tender on 6th November 2017 at a prestigious Government University in Jakarta for 70 sets of Gilson Pipetman G Single and Starter Kit. It is biggest quantity for one single order in 2017. Gilson Pipetman G which was launched over a year ago by Gilson France become popular in a short span of time. PIPETMAN G offers you one of the lowest pipetting forces on the market thanks to a new easy glide piston displacement that gives ideal pipetting and purge sensations. New stocks arrive every month. Please see our Updated Ready Stock for your reference. We received order on 7th November 2017, 6 sets of TRUSPEED LR from a mining company. 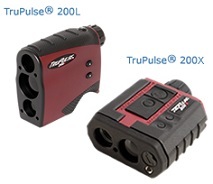 The TruSpeed LR model offers the same functionality as the LTI 20/20 TruSpeed but with one difference -- it has an extended range of up to 4,000 feet and anti-jam firmware. Offers pinpoint, single-vehicle targeting in multilane traffic and is impervious to lidar and radar detectors. Comes standard with a shoulder mount and runs on 2 C-cell batteries. Key Features are: Six con Base Buttons for ease of operation, Shoot through light rain or snow with the one button weather mode, Removable Shoulder Rest Enhance aiming stability and Extended Range (4,000 Feet) and anti-jam Firmware. Please call our Mr. Tri Wardhana or Ommar Win for more details and to see following Demo units. We delivered 10 Tygon and 10 Ismaprene Tubings on 26th October 2017 to our routine customer. This customer also ordered on 15th August 2017 for 20 sets of Tygon Tubings. We received order for 10 sets of Tygon on 19th July 2017 from our routine customer located in Medan. We also delivered 10 sets of Tygon on 22nd July 2017 and 17th April 2017 respectively to our routine customers. We delivered 10 sets of Ismaprene on 14th March 2016 to use with IPC-16 from Medan. We already delivered 10 sets on 12th February 2017 to Surabaya. Due to growing number of Ismatec Peristaltic Pumps in Indonesia and requirement of Tubings we keep ready stock of most often needed tubings. IPC pumps come in 4,8,12, 16 or 24 channels and correct size of tubings are essential for all users. We also keep Ready Stock IPC -16 in 2016. Please call Ms. Farida Win, who has been trained by Ismatec in Europe for more details. We sold again on 8th September 2017 one Flame Photometer M 410 complete with Compressor, BlueNotes Software and Printer to our loyal customer who already have 5 (five)sets. Because of growing number of M 410, following are ready stock of consumables for Flame Photometer. We also provide one full day FREE Installation & Application training at our office in Jakarta to all our customers. We have sold our ready stock TruCam on 28th August 2017 to a mining company. We sold handful of TruCam in the last few years. New stock will arrive in October 2017 because of frequent "Demo Requests". 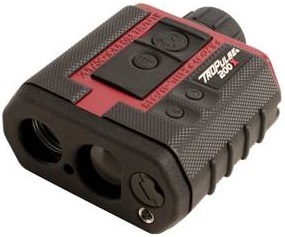 TruCAM is an integrated laser with a digital video camera, making the LTI 20/20 TruCAM the most sophisticated speed enforcement tool available today. It is the only all-in-one handheld laser-based video and photo camera on the market. The TruCAM collects and stores a complete chain of video evidence for both speeding and tailgating, along with a high-resolution image that identifies vehicle make, model and license plate number and facial characteristics of the driver. By utilizing GPS, it automatically generates location-based information every time the TruCAM is used. This provides managers with historical data to determine why, where, when and how to deploy valuable human and capital assets in the future. Please call our Mr. Tri Wardhana or Ommar Win for more details and to see Demo unit. New Purchase Order received on 15th August 2017 for 20 sets. No more stock left. New stock will arrive in October 2017. We received order for 10 sets of Tygon on 19th July 2017 from our routine customer located in Medan. We also delivered 10 sets of Tygon on 22nd July 2017 and 17th April 2017 respectively to our routine customers. We delivered 10 sets of Ismaprene on 14th March 2016 to use with IPC-16 from Medan. We already delivered 10 sets on 12th February 2017 to Surabaya. Due to growing number of Ismatec Peristaltic Pumps in Indonesia and requirement of Tubings we keep ready stock of most often needed tubings. IPC pumps come in 4,8,12, 16 or 24 channels and correct size of tubings are essential for all users. We sold one Flame Photometer M 410 complete with BlueNotes Software on 6th July 2017 to our regional dealer in Pekanbaru in Riau. Because of growing number of M 410, following are ready stock of consumables for Flame Photometer. Flame Photometer, Colorimeter, Fluid Bed Dryer, Magnetic Susceptibility Balance, Microwelder, Chloride Analysers. Please call our Ms Farida Win who was trained in Sherwood Scientific in United Kingdom, for more technical details. Please call today Mr. Tri Wardhana to see our "complete range of LTI products"
We are so excited to announce that ALIBRE is back on its own!. On June 8th 2017, PT Siberhegindo Teknik is appointed as Representative of Alibre 3D Design from USA to cover five countries including Indonesia, Malaysia, Singapore, Vietnam and Myanmar. PT. Siberhegindo Teknik successfully sold quite a number of Alibre 3D Prefessional and Design Expert License to Indonesian customer in 2011 till 2014 before it was taken over by Geomagic followed by 3D Systems. 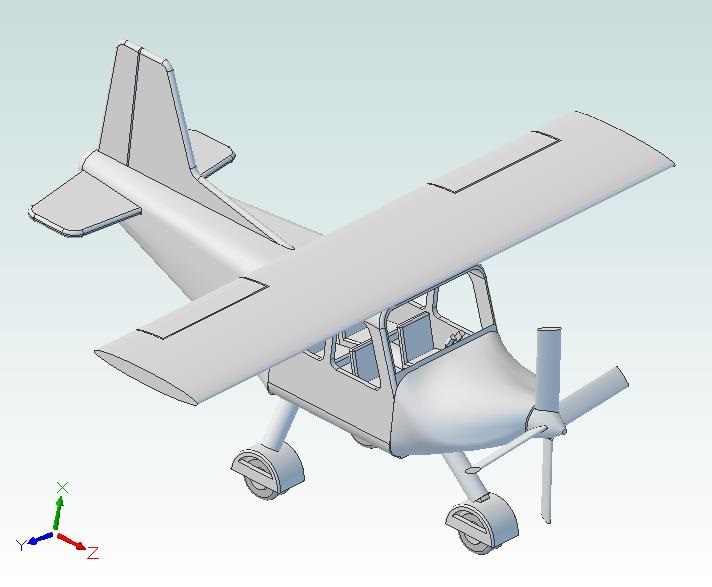 During and after that Siberhegindo team become capable of providing local trainings of Alibre 3D Design to many Indonesian users. A great news announced by Alibre former team to be on its own in June 2017 is a such a good news to our Indonesian customers. Mr. Thein Win and Siberhegindo team is fully committed to ALIBRE to successfully bring back much more sales in these extended five countries. Call Mr. Win or Ommar Win today to get updates, quotations and sample designs for 3D Printing. is now back. Click here to download 30 days trial software! Big changes are coming soon. 1. TIMER.....................it switches off automatically at your setting time. 2. HEATER..................it has range of temperature from 30° - 80°C. 4. DRAIN OUTLET........it can drain old / used water very easily through outlet. Franco Jakarta Sales Price for SW 6H is Rp. 18 Mio and SW 12 H is Rp. 28 Mio, plus VAT 10%. We received again order for 10 sets of Tygon on 22nd June 2017 from our routine customer located in Medan. We also delivered 10 sets of Tygon on 17th April 2017 to our routine customer in Surabaya. We delivered 10 sets of Ismaprene on 14th March 2016 to use with IPC-16 from Medan. We already delivered 10 sets on 12th February 2017 to Surabaya. Due to growing number of Ismatec Peristaltic Pumps in Indonesia and requirement of Tubings we keep ready stock of most often needed tubings. IPC pumps come in 4,8,12, 16 or 24 channels and correct size of tubings are essential for all users. We delivered MAAG Trudex Pump on on 27th April 2017 to Mitsubishi Plastic Film Extrusion company that was ordered on 12 January 2017. We thank you to the management as this is the second pump they ordered from MAAG/Siberhegindo Teknik. 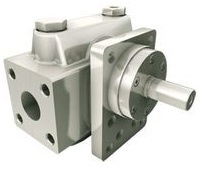 Trudex pump is high-pressure gear pump for thermoplastic applications. It guarantees constant conveying in extrusion lines and thus highest product quality. 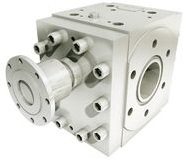 With its robust construction the new Trudex high pressure gear pump enables up to high pressure ranges up to 700 bar which is the upper limit for conventional gear pumps. It has high overall efficiency due to overall cutting-edge and slide bearing technology. Flexible use due to simple retro-fitting and low pulsation even at high pressure differencials. Please call Mr. Win directly or Ommar Win if you want to know more about Maag Pump Systems. (90% of Indonesian polymer and extrusion industries use only Maag Pumps because of MAAG PUMP SYSTEMS superior quality and Siberhegindo's unique local 24/7 technical supports). We received order again for 4 sets of Gilson Pipetman "L" Multi Channel from Research Institute LIPI on 25th April 2017. During 2016 just after the launch of Pipetman L,we delivered big quantity of Gilson Manual Liquid Handling products including "L" to Universitas Gajah Mada via our regional dealer on 1st November 2016 and again on 15th September 2016. We also delivered on 10th October 2016 to Oceanography Department for bigger quantity of Pipette order including "L". October 2016 was an outstanding month and exceeded our expectation as we need to replenish our ready stock for two times. Pipetman L Multichannel version becomes so popular as it offers an extremely lightweight pipette, that has been designed to fit naturally in your hand. Its new shape ensures a perfect fit while the new hook reduces tensions while holding it. An adjustable tip ejector button has also been implemented to adapt to both right- and left-handed users Either push the tip ejector button with the tip of your thumb or with the base of your thumb, making it more comfortable and easier to access for any size hand. Please call our Ms. Farida Win, Mr. Aris Haryanto or Mr. Ommar Win who were trained in Gilson SAS in France for more technical details. We received repeat order for TW-82M HC on 21st April 2017 from a mining comapny. Since our existing stocks are all sold out, we will add new stock in May 2017. TW-82 is a best seller as every arriving stock are sold out quickly. New stock arrives every month. Buy before you get late. We again received order for TW-82M HC on 17th March 2017. Since our existing stocks are all sold out, we will add new stock in May 2017. TW-82 is a best seller as every arriving stock are sold out quickly. New stock arrives every month. Buy before you get late. We received new order for 10 sets of Ismaprene on 14th March 2016 to use with IPC-16 from Medan. We already delivered 10 sets on 12th February 2017 to Surabaya. Due to growing number of Ismatec Peristaltic Pumps in Indonesia and requirement of Tubings we keep ready stock of most often needed tubings. IPC pumps come in 4,8,12, 16 or 24 channels and correct size of tubings are essential for all users. NORMAL SALES PRICE USD. 1,800.00 - NOW ONLY USD. 1,000.00 Plus VAT 10%. We have ready stock Brand New Grade-Pro Receiver Model RD2E-B complete with mounting bracket and battery charger. The Grade-Pro receiver is designed especially for use on rubber tired back hoes or small excavators. It can also be applied to small dozers. It features a 12" high receiving window that accepts laser strikes through a 180 degree sector. The receiver can be powered by the 12 or 24V machine battery or optional 6V battery pack. NORMAL SALES PRICE USD. 3,800.00 - NOW ONLY USD. 3,040.00 Plus VAT 10%. We have now ready stock of F155001 Peristaltic Pump Module Minipulse 3 and F117606 Pump Head Module R4. MP3 has high resolution and precision speed control for delivering, low pulse flow without sample shearing or degration. The Minipulse 3 is rugged peristaltic pump with interchangeable heads for delivering smooth, low pulse flows of biological and chemical fluids in 1, 2, 4 or 8 channels standard flow rate and 2 or 4 high flow rate configuration. Please call Ms. Farida Win, who has been trained by GILSON SAS in Europe for more details and to see demo-unit. NORMAL SALES PRICE EURO. 2,600.00 - NOW ONLY EURO. 1,600 Plus VAT 10%. The "original" quiet compressor with a noise level below 45 dB(A). 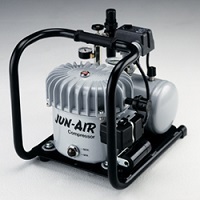 The JUN-AIR oil-lubricated compressor is the lifeline of dental surgeries worldwide, and many units are still in operation after 25 years - a testament to the quality and reliability of JUN-AIR compressors. JUN-AIR oil-lubricated piston compressors are — contrary to traditional compressors — not supplied with piston rings. Instead the tolerance between the piston and the cylinder has been reduced, minimizing the heat development and the energy loss. NORMAL SALES PRICE EURO. 300.00 - NOW ONLY EURO. 200 Plus VAT 10%. 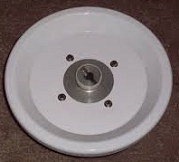 We still have one unit ready Brand New stock Rotor/Bucket Order No. 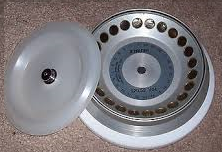 220,59 V04 for Hermle Centrifuge Z32HK and Z32 to be able to use max speed 17,000 rpm, Temp. at max speed -1 Degree C, RCF Value 27,460 x g, Acceleration in s 25/220, Decelaration in s 25/370, to be used with Tube Rack 1 x 2,0 ml, 11mm Dia, Length 40/45mm. Please call Mr. Win, for more details and to see the ready stock. NORMAL SALES PRICE Rp. 11,200,000 - NOW ONLY Rp. 7,500,000 Plus VAT 10%. 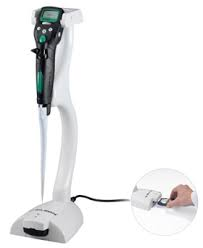 Pipetman Concept C300 is fully automatic motorized (20 - 300 μl) that virtually eliminates variability of results among users and require little forces to aspirate and dispense samples. Concept 300 has special features and able to download data to PC and you are able to program according to your needs. It has very clear and sharp display. Main Unit, Charging Stand, 3 Batteries, Sample Tips, Software and Operation Manual. 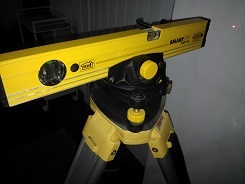 6 LTI TruPoint 300 Total Station equipped with Laser & Camera.
" LIMITED QUANTITY, FIRST COME FIRST SERVE"
Call Mr. Win or e-mail theinwin@siberhegindo.com for quotation. We sold one Filter Na and one Filter K on 21st December 2016. Following are remaining ready stock of consumables for Flame Photometer. 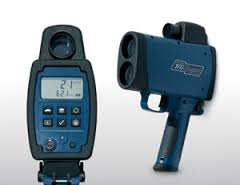 We again sold on 6th December 2016 another LTI 20/20 TruSpeed LR Speed Gun. We also sold TruSpeed SA on 4th November 2016 after we sold on 29 July 2016 and 23 August 2016 to a dealer 2 (Two) complete sets of TruSpeed DC. The TruSpeed series have become the most popular lasers in the world because you get everything you would expect from LTI with affordable price. The TruSpeed DC versions stores all the speed data internally, allowing you to achieve and download all your speed measurement data. We have a day meeting with PT Indorama Synthetics Polymer operation team and management on 6th December 2016 at their PMC main office in Purwakarta plant. 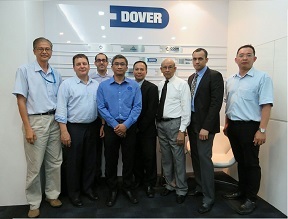 In the picture Mr. T.J. Parmer and his team together with Mr. Seah Poh Siang from Maag Singapore and Mr. Thein Win. PT Siberhegindo Teknik together with Maag Group are always proud to be the routine supplier of Gear Pumps and Spare Parts to IRS since 1995. We thank to IRS management for their continuous trust. Due to production increase IRS has replaced Maag Vacorex 180 with Vacorex 224 MR and Vacorex 280 MR Pumps which are capable to produce 300 ton and 500 ton per day respectively. Maag Pumps run for 24 hours a day non stop for couple of years. Almost all of Maag Pumps in Indonesia PET factories are running for more than 15 to 20 years without any troubles. 90% of Polyester Plants in Indonesia use MPS pumps. In 2011, Indorama group PT Polypet (which use our MAAG Gear Pumps) under the name PT. Indorama Ventures. 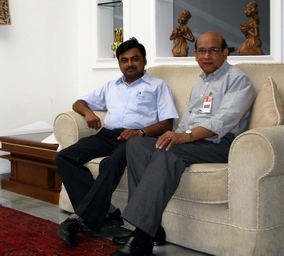 Siberhegindo and MPS Singapore are always working very closely with all IRS companies. Mr. T.J. Parmer & Team, Mr. Seah Poh Siang and Mr. Thein Win. Since last ten years Korean products are well accepted in the Indonesian market. Samsung, Dewoo, LG, etc. household electronic products sales have grown significantly in Jakarta and other big cities. Korean made KIA and Hyundai cars fill all the roads in Indonesia in a period of relatively short time by competing other long established brands. We can witness that many of Korean products quality become worlds' class day after day and growing its market share. We are interested to work together with Jeoung 3D solution company in the future for high quality 3D manufacturing machines due to our years of experience and wide customers' coverage in 3D printing technology and Software. 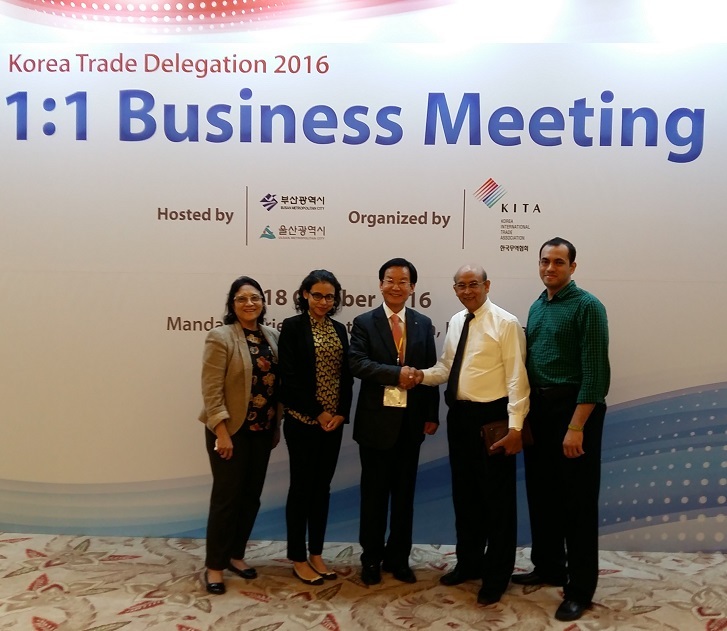 A positive meeting with Jeoungwoo CEO Mr. Byung-Woo Park and Mr. Thein Win and family took place on 18th and 20th October 2016 in Jakarta at the Mandarin Oriental Hotel and Siberhegindo office. We believe these first meetings will build roads for our future cooperation. Due to growing work load and sales we have bought two brand new operation vehicles in August 2016 for Mr. Aris Haryanto and Mr. Ommar Win. One is Datsun GO+ Van for GILSON MLH daily activities and the other is KIA Rio Sedan for our principals' visits. Both vehicles are quite comfortable. With this two additional investments we already have eight vehicles in our operation. We believe it is more efficient and successful to have a dedicated qualified team provided with optimum facilities. We plan to replace all our existing Toyota Avanza with new models in 2017. All our staff are provided with new Laptops also in 2016. Including our own new office building on our own land bought in 2013 in a "strategic location", we are proud to mention that our assets have significantly grown within 2013 and 2016. We are also very well equipped with latest office facilities in a very nice environment. With strong fundamentals, we can serve far better than any other competitors to all our customers and principals. We sold one Tube Nebuleiser Inlet (150 mm) on 18th August 2016. Following are remaining ready stock of consumables for Flame Photometer. GILSON Pipetman M - Motorized. We received on 29th June 2016 repeat order for two PIPETMAN P1200M Motorized from a multi-national company. P1200M is a new motorized member of the PIPETMAN family from Gilson. PIPETMAN M is a fusion between the renowned accuracy, precision and robustness of the PIPETMAN P and user-friendly functions that will simplify your work day. PIPETMAN M is so easy to use that you will have the feeling that you are using a PIPETMAN P. PIPETMAN M Multichannel can be used while charging without compromising performance. PIPETMAN M Multichannel's Lithium-ion battery has been designed to ensure 900 pipetting cycles at maximum speed (up to seven 96 well plates) between charge cycles. All M series come with free download Software which can easily program and modify your daily needs and maintenance control. We now keep "ready stock" of P10M, P20M and P1200M Single and P8x20, P8x200, P8x300 and P8x1200 Multi Channel for Demo and Sales. 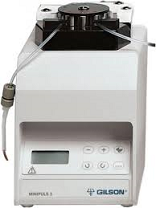 Please see our Ready Stock or call Ms Farida or Mr. Aris or Mr. Ommar to test Pipetman G, L and M Motorized series. For Service call Mr. Slamet. We service all brands of pipettes. Maag is known worldwide as a pioneer and technology leader in the development and manufacturing of gear pumps and system solutions tailored to meet the needs of individual customers. For decades the company has stood for innovative pelletizing systems of the highest quality. Gala Industries and Reduction Engineering Scheer have recently joined the Maag family, thereby extending our product portfolio to include pulverizers and other pelletizing systems. Please see video at http://evolution-of-maag.com/en/microsite. Sales channel integration meeting for SEA was held on 2nd May 2016 at the Dover Office in Singapore. This meeting was lead by Mr. Urs Gull, Vice President of Maag Dover, Switzerland and supported by Mr. Seah Poh Siang, Maag SEA Managing Director from Singapore, Mr. Chew from the Automatic operations in Malaysia (Maag grinding Center) and Mr. Boonlert from Thailand Gala operation. 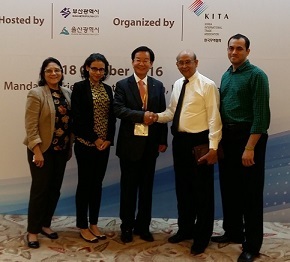 Mr. Thein Win and Mr. Ommar Win had represented from Indonesia for pump and screen-changer equipments. 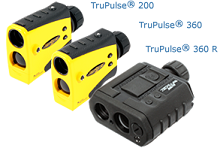 The TruPoint 300 is the laser measurement tool that professionals worldwide want to have in their hands. This ground-breaking product is a small, lightweight and compact total station ideal for use in applications such as Crash & Crime Scene Investigation, GIS, Surveying, Construction, Electric Utilities and many more. The TruPoint 300 total station produces survey-grade accuracy, offers onboard data storage and calculations; and costs thousands less than conventional total stations. 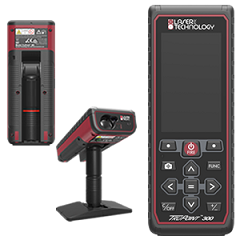 It measures distance, inclination and horizontal angles for X, Y, Z measurements.The improved data collection workflow saves time and accurately captures measurements up to 300 meters. 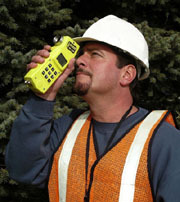 he TruPoint 300 total station is the go-to tool for collecting the measurements you need quickly, easily, and safely. No need to carry around multiple, heavy tools anymore. Please call our Mr. Tri Wardhana or Ommar Win for more details and to see Demo unit. LTI TruPoint 300 Total Station equipped with Laser & Camera. A manufacturing company ordered on 10th May 2016, "200,000" of Dimond Tips, D1000 Eco-Pack part no. F161670, (100 - 1000 µL capacity) in one order which is recorded as one single big order. DIAMOND Tips are designed, developed, and manufactured in order to fit Gilson pipettes perfectly. 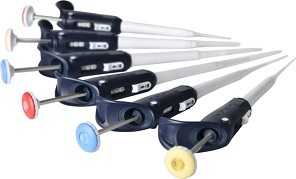 They ensure optimal performance of your PIPETMAN pipettes across the full volume range. Optimized geometry and pure polypropylene material ensure complete dispensing for consistent results. 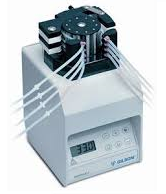 The use of Gilson’s pipetting system guarantees accuracy and precision. No risk of contamination: DIAMOND Tips are manufactured in a clean room. Easy identification with color-coded packaging. Siberhegindo always keep ready stock of all tips. Call our Gilson, France trained team today if you need ready stock. In just less than two months time our Lab/ANI sales manager Miss Farida sold again one more Sherwood Flame Photometer on 3rd May 2016. This time M360. The Model 360 Flame Photometer is a single channel, five element (Na, K, Li, Ca, Ba), analogue output and digital display Flame Photometer. It has inherited a great deal from our well respected, higher priced models. The Model 360 Flame Photometer's mixing chamber, burner stem and burner head are taken from our world renowned Model 410 Flame Photometer. Automatic flame optimisation comes from our Dual Channel Flame Photometer Model 420 series of instruments. The Model 360 Flame Photometer is a new product built with tried and tested components where it really matters. It has the best limits of detection available from a low cost instrument and precision comparable to higher cost instruments. Please call our Ms Farida Win who was trained in Sherwood Scientific in United Kingdom, for more technical details. Our ready stock PIPETMAN Neo, G and L were all sold out April 2016 for a tender to Government Research Institute LIPI. Since its introduction many lab technicians are eager to own Pipetman G and L for their "Premium Pipetting Comfort". 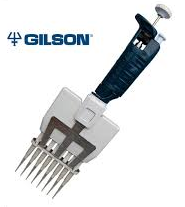 PIPETMAN G and L are new mechanical, air-displacement pipette from Gilson. PIPETMAN G and L offers you one of the lowest pipetting forces on the market thanks to a new easy glide piston displacement that gives ideal pipetting and purge sensations. Enjoy a new addition to PIPETMAN line with its legendary accuracy, precision, and robustness…with the highest comfort! Please see our Ready Stock or call Ms. Farida, Mr. Aris or Mr. Ommar who are all trained in Gilson, France in 2015 to test Pipetman G, L and M, all Motorized series. For Service call Mr. Slamet. We service all brands of pipettes. Just "CLICK" on this picture to see Gilson 2015/2016 Electronic Catalog with full of new products. We received order for Fisher Leak Detector XLT-30A with big foot on 25th April 2016 from Jaya Construction. 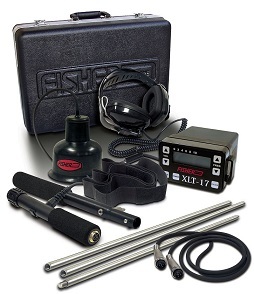 Fisher XLT-30 A leak detector is built to perform and priced to compete. With advanced electronic amplification and filtering, a tactile keypad, an easy to read digital display and notch feature (which allows independent suppression of outside interfering noise) the XLT-30 proves its worth again and again. In March 2016, we are informed by a dealer PT. Tali Jagat Sejati that BP Migas is using Refitherm Pump. Applications in chemical and industrial systems are very demanding. High process pressures, high temperatures and high-viscosity media are not uncommon in such environments. And it is in precisely these environments that the tried-and-tested gear pumps from Maag display their true potential. Refinex / Refitherm gear pumps are robust, heatable conveying units made from cast steel that satisfy the high quality demands of the chemical processing industry. The extremely wide selection of components and materials allow customised pumping technology solutions to be created that never let customers down. Maag: for when reliability is crucial. Please call Mr. Win directly or Ommar Win if you want to know more details and MAAG/Siberhegindo's unique 24/7 technical supports. We have sold Air Compressors for Sherwood Scientific Flame Photometer on 7th March 2016 to some of our existing Flame Photometer Model 360, Model 410, Model 420 and Model 425 users. There are two compressors, Model 851 and Model 855 both with 230V and 50Hz. The model 855 has a water cooled trap for operation in humid atmospheres. Both compressors provide a dedicated, clean, dry air supply which is vital to achieve stable flame conditions and constant sample delivery, ensuring good precision of results. Please call our Ms. Farida Win who was trained in Sherwood Scientific in United Kingdom, for more technical details and to to see our "ready stock". On 22 February 2016 we received a Gilson Pipetman order from a big multinational company located in Sidoarjo, East Java, Pipetman L Starter Kit, G-Micro-Volume Kit, Macroman, Pipetman L Multichannel P8 x 300L and P12x200L. Like the single channel PIPETMAN L, the Multichannel version also offers an extremely lightweight pipette, that has been designed to fit naturally in your hand. Its new shape ensures a perfect fit while the new hook reduces tensions while holding it. An adjustable tip ejector button has also been implemented to adapt to both right- and left-handed users Either push the tip ejector button with the tip of your thumb or with the base of your thumb, making it more comfortable and easier to access for any size hand. Please call our Ms. Farida Win, Mr. Aris Haryanto or Mr. Ommar Win who were trained in Gilson SAS in France for more technical details. 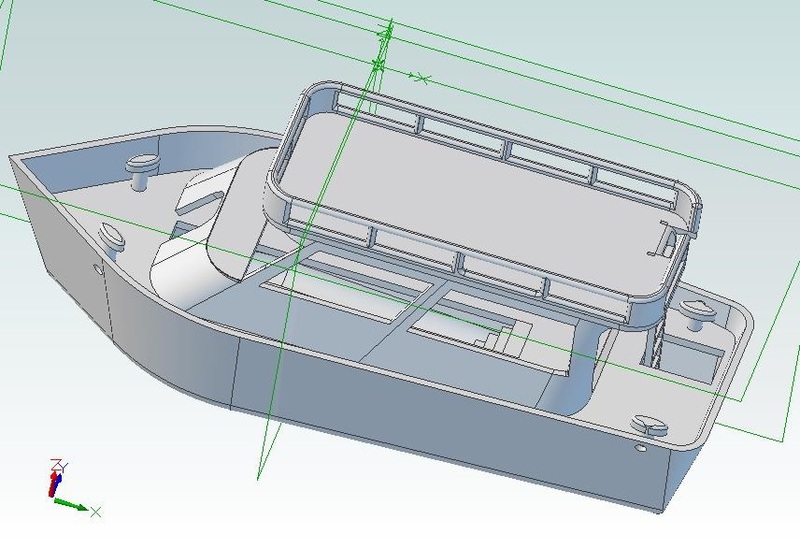 We design all engineering and art works ready for your 3D Printers and CNC Machines of any brands. We also accept job orders for tailor made engineering design for all your needs of any sizes and dimensions no matter how sophisticated it is and no matter where you are in this part world. All we need is one page sketch (for example cars, ships, aeroplanes, buildings, architectures, engines, spare parts, art works etc. 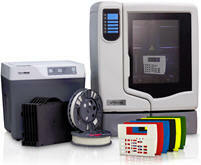 of all kinds) and dimensions from you and print size, accuracy, brand and type of your 3D printers. "Quality of 3D Design is key for any 3D Printers". We have more than 14 (Fourteen) years of 3D design and 3 D Printer experiences which guarantee all your design needs. 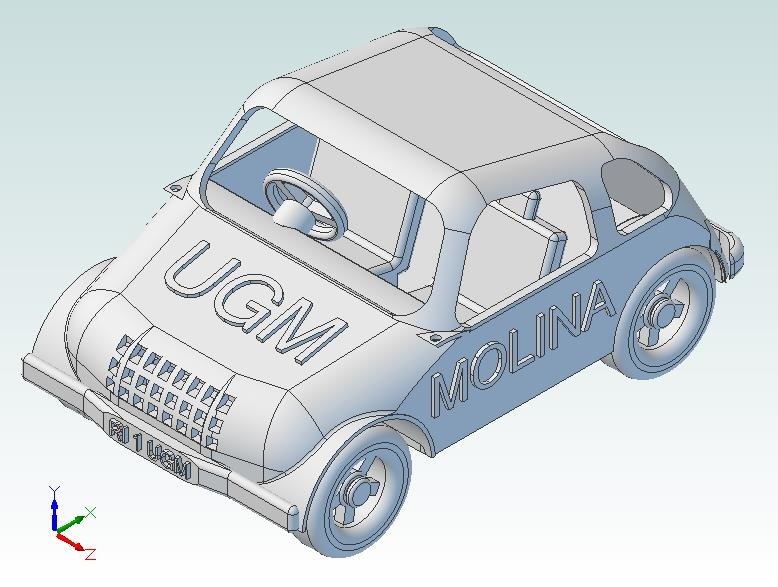 We use Geomagic 3D Design Software analyzed and edited by Materialise Magic 3D Software to make sure models are ready to be printed and machining without problems. Instead of employing an experienced expensive designers and buying very expensive 3D softwares, call and hire us for our service. We guarantee for your satisfaction as we have been working already for more than 50 customers worldwide. Click "More Designs" to see all our ready made designs. Please call Mr. Win at + 62 21 8379 4843 or Mr. Ommar Win + 62 21 8293834 today for all your 3D design needs or visit our showroom to see various ready made 3D designs (STL files) and 3D models. Few of our Ready Made 3D Designs that we can send in STL format by email ready to print at 3D Printer of any brands. We are glad that complete set of Sherwood Scientific Flame Photometer M410 is again sold on 2nd February 2016 to a Multinational Manufacturing Plant located in West Java. We delivered several sets of Flame Photometers for Foods & Beverages, Agriculture, Chemical, Cement, Paper and Pulp Factories next to Educational Institutions. We also delivered consumables on 8th January 2016 as we also keep ready stock of following consumables for all our Flame customers. Please call our Ms. Farida Win who was trained in Sherwood Scientific in United Kingdom, for more technical details. Flame Photometer, Colorimeter, Fluid Bed Dryer, Magnetic Susceptibility Balance, Microwelder, Chloride Analysers. We sold again the PIPETMAN Neo MULTI on 27th January 2016 to a prestigious University in Jakarta. PIPETMAN Neo MULTI is a fully adjustable, air-displacement pipette. 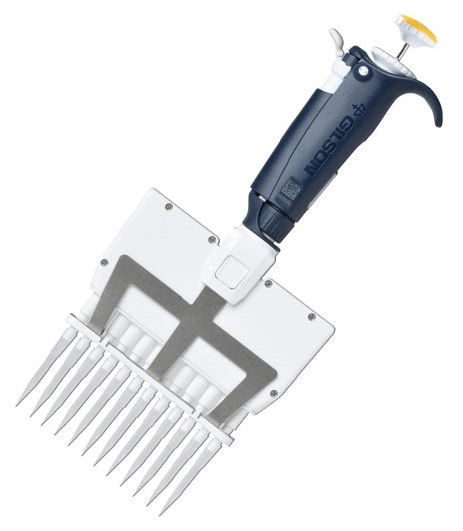 It delivers unrivaled performance, precision, and durability while offering a unique level of comfort that is unmatched by any other multichannel pipette. PIPETMAN Neo MULTI provides all the benefits that built the reputation of the legendary PIPETMAN, with the added bonus of increased comfort. Easy to use, you will especially appreciate the smoothness of the piston stroke and of the tip ejection.With uncontested reliability and durability, PIPETMAN Neo MULTI is the economical, efficient solution to years of pipetting comfort. Please see our Ready Stock or call Mr. Aris or Ms. Farida or Mr. Ommar who are all trained in Gilson, France in 2015 to test Pipetman G, L and M, all Motorized series. For Service call Mr. Slamet. We service all brands of pipettes. A multinational consumers goods manufacturer has ordered again on 15th January 2016 Ismatec IPC -16 Microprocessor Control Delivery Pump. This customer already has more than 14 units of Idex-Ismatec Peristaltic Pumps. IPC pumps come in 4,8,12, 16 or 24 channels and has no dispensing features, no calibration functions, only Run/Stop speed Control and Direction. Floor rates are set at 0.0004-11 ml/min (per Channel for IP-N Series) and 0.002-44 ml/min (per channel for IP Series). There is 6 button membrane key pad with LED display and 2 LEDs indicating LOCAL and REMOTE (analog interface) operation. Speed Setting can be done in 0.1 rpm for IP and 0.03 rpm for IP-N. Siberhegindo now can supply IPC-16 together with LabVIEW Software and Connection Cables to PC. We will add IPC in Ready Stock in February/March 2016. Please call Ms. Farida Win, who has been trained by Ismatec in Europe for more details. We keep ready stock as of June 2016 of following tubings for IPC-16. We sold 1 units of Criterion RD1000 to Forestry Department in Lampung on 21st January 2016. There are already more than 200 units of RD 1000 in Indonesia supplied, supported and trained by us. RD 1000 is accurate, lightweight, multifunctional, dependable and relatively inexpensive. Are you ready to start measuring more, while moving less? 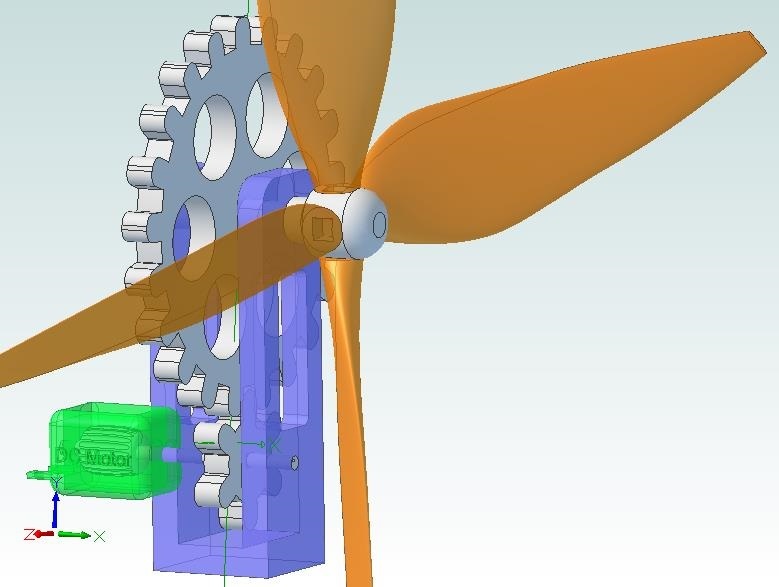 By integrating a tilt sensor within the Criterion RD 1000, you can use it as a dendrometer and measure diameters anywhere on the stem as well as the height at which a specific diameter occurs. It can also be used as a slope-corrected Basal Area scope for variable plot cruising. Obtain diameter accuracy of +/- 0.25 inch out to 80 feet away from the tree by utilizing the included detachable magnifying lens. There are more than 100 RD1000 being used in Indonesia. Please call our Mr. Tri Wardhana or Ommar Win for more details and to see Demo unit. 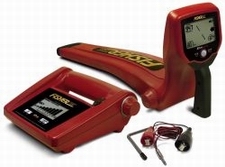 We received order for Fisher Leak Detector XLT-30A with big foot on 25th November 2015. 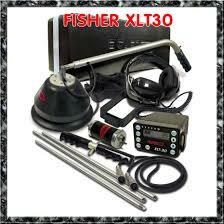 Fisher XLT-30 A leak detector is built to perform and priced to compete. With advanced electronic amplification and filtering, a tactile keypad, an easy to read digital display and notch feature (which allows independent suppression of outside interfering noise) the XLT-30 proves its worth again and again. A complete set of Sherwood Scientific Flame Photometer M410 is again sold on 28th September 2015 to a Sugar Manufacturing Plant located in West Java. We delivered several sets of Flame Photometers for Foods & Beverages, Agriculture, Chemical, Cement, Paper and Pulp Factories next to Educational Institutions. We also delivered consumables on 30th September 2015 as we also keep ready stock of following consumables for all our Flame customers. Please call our Ms. Farida Win who was trained in UK, for more technical details. 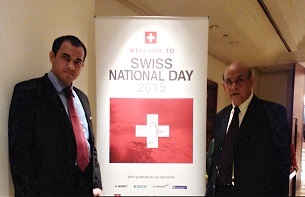 On Friday 31st July 2015, The Swiss Embassy hosted its Swiss National Day 2015 at the Ballroom, Grand Hyatt in Jakarta. Siberhegindo Teknik has again been a sponsor to the prestigious event similar to previous years. 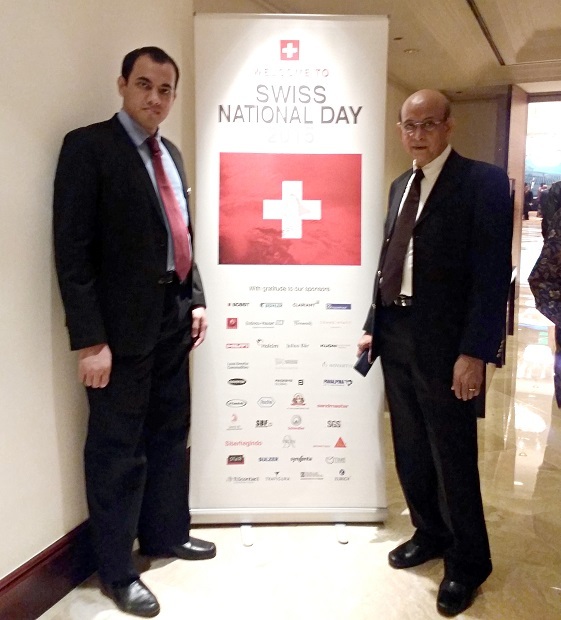 Mr. Thein Win has deep root of contacts and relationships with Swiss Companies since he joined Kern & Co. AG, located in Aarau, Switzerland in 1979 followed by SiberHegner AG. located in Zurich, Switzerland in 1992. More than 1'000 prominent guests including Cabinet Ministers and Jakarta’s Governor Mr. Basuki Tjahaja Purnama attended this special event, enjoying the free flow beautiful pinot and extravagant selection of wonderful Swiss food prepared by the Grand Hyatt hotel and supported by generous sponsors. Once again, we would like to congratulate Madam Swiss Ambassador Yvonne Baumann and the embassy staff for creating a very memorable night. Our ready stock PIPETMAN G were sold out on 21st August 2015 to a new laboratory at the Forestry Department. 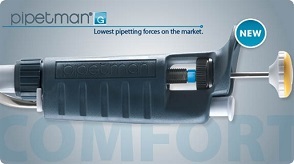 Since its introduction many lab technicians are eager to own Pipetman G for its "Premium Pipetting Comfort". 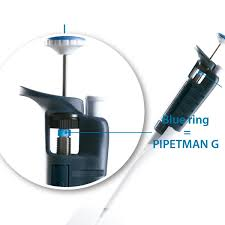 PIPETMAN G is a new mechanical, air-displacement pipette from Gilson. PIPETMAN G offers you one of the lowest pipetting forces on the market thanks to a new easy glide piston displacement that gives ideal pipetting and purge sensations. Enjoy a new addition to PIPETMAN line with its legendary accuracy, precision, and robustness…with the highest comfort! Please see our Ready Stock or call Ms. Farida or Mr. Aris or Mr. Ommar who are all trained in Gilson, France in 2015 to test Pipetman G, L and M, all Motorized series. For Service call Mr. Slamet. We service all brands of pipettes. 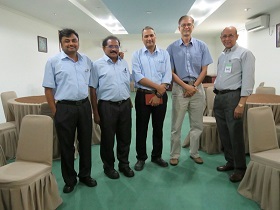 Because of growing numbers of Laser technology Inc. USA TruCAM Laser Speed Detector in Indonesia Mr. Sam Steyn and Mr. Christopher Yuen from LTI USA visited our Indonesian TruCam users in Jakarta on 14-16 June 2015. Sam had demonstrated that TruCam can print out now right on the spot the photograph of vehicles' and plate numbers with a portable printer. 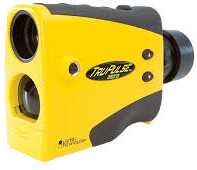 TruCAM is an integrated laser with a digital video camera, making the LTI 20/20 TruCAM the most sophisticated speed enforcement tool available today. It is the only all-in-one handheld laser-based video and photo camera on the market. 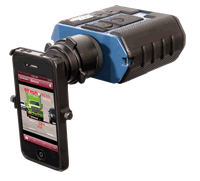 The TruCAM collects and stores a complete chain of video evidence for both speeding and tailgating, along with a high-resolution image that identifies vehicle make, model and license plate number and facial characteristics of the driver. By utilizing GPS, it automatically generates location-based information every time the TruCAM is used. This provides managers with historical data to determine why, where, when and how to deploy valuable human and capital assets in the future. Please call our Mr. Tri Wardhana or Ommar Win for more details and to see demo TruCam with portable Printer. LTI TruCam Demo at PT. Jasa Raharja on 15th June 2015. TruCAM can now print out photograph of vehicle and its plate number together with speed right on the spot. 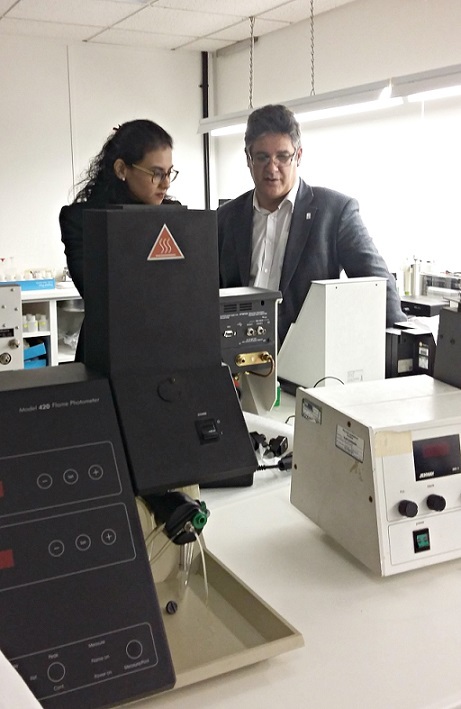 Farida Win has attended Product Training at the Sherwood Scientific in Cambridge, UK in the first week of December 2014. Siberhegindo has sold quite a large number of Sherwood Scientific products predominantly Flame Photometers successfully in Indonesia since 1999 (over 15 years now) and it is now time for our staff to update the product knowledge due to growing technology. Farida has been trained intensively hands on by Mr. Jon Copsey who is highly experienced Senior Product Manager and Ms. Karen Lee throughout the training. Since Farida has studied in Australian University for almost four years she is able to follow the product training well and able to give updated technical supports to our Indonesian customers and Sherwood products users more efficiently. Please feel free to contact Ms. Farida Win who will be happy to provide all application and technical supports to all our existing and new customers. June 2015 is an outstanding month for Gilson MLH products with year to date highest sales. We delivered on 22nd June2015 three fully motorized PIPETMAN M as well as Pipetman G complete ranges to Indonesian Research Lab located inside RSCM compound. We aslso delivered on 17th June 2015 Pipetman L of different sizes to an Agro Research Lab under Sinamas Group. PIPETMAN M is a new motorized member of the PIPETMAN family from Gilson. PIPETMAN M is a fusion between the renowned accuracy, precision and robustness of the PIPETMAN P and user-friendly functions that will simplify your work day. 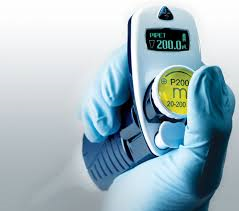 PIPETMAN M is so easy to use that you will have the feeling that you are using a PIPETMAN P. PIPETMAN M Multichannel can be used while charging without compromising performance. PIPETMAN M Multichannel's Lithium-ion battery has been designed to ensure 900 pipetting cycles at maximum speed (up to seven 96 well plates) between charge cycles. 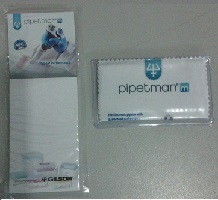 Please see our Ready Stock or call Mr. Aris or Ms. Farida or Mr. Ommar to test Pipetman G, L and M, all Motorized series. For Service call Mr. Slamet. We service all brands of pipettes. Siberhegindo again serviced and delivered Gilson Pipettes to Eliminate Dengue Project in June 2015. Eliminate Dengue Indonesia is a research collaboration led by the Faculty of Medicine at Gadjah Mada University and funded by Yayasan Tahija (The Tahija Foundation). In January 2014, Eliminate Dengue Indonesia began releases of Wolbachia mosquitoes in communities around Yogyakarta, a densely populated city with a high prevalence of dengue outbreaks. The aim of these releases is to establish Wolbachia in the local mosquito populations to reduce the transmission of dengue between people. Eliminate Dengue project widely uses Gilson Manual and Motorized Pipettes ordered by The Tahija Foundation from PT. Siberhegindo Teknik. We thank to the Tahija Foundation for continuously using our Gilson Manual Liquid Handling products since the project started. We are also glad to learn that Microsoft founder Mr. Bill Gates gives full support to this project. 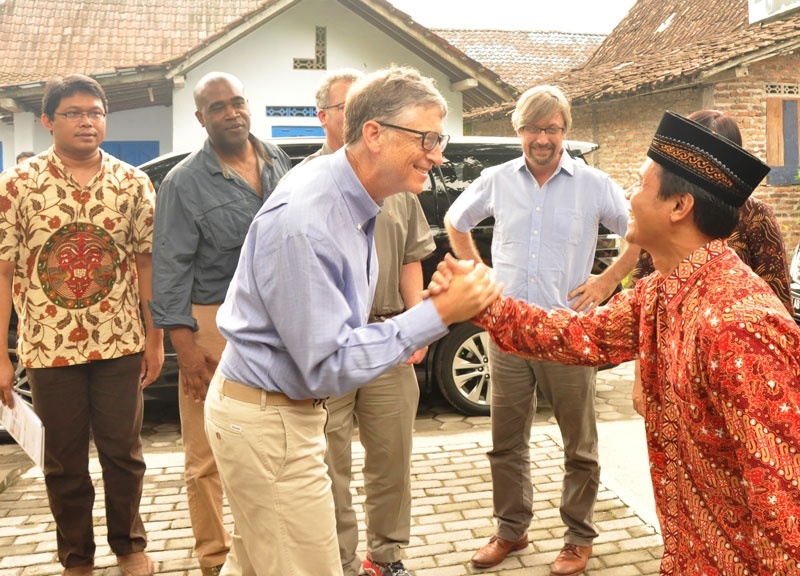 Microsoft founder Bill Gates met with residents and community leaders in Kronggahan Eliminate Dengue field site during his visit to Yogyakarta in April 2014. 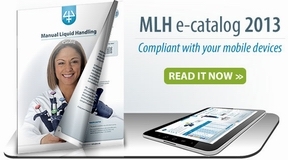 We are glad to announce the release of updated 2014/2015 Gilson Manual Liquid Handling New E-catalog. At one simple click, you will see all the details of each pipettes, tips and accessories and also watch the videos on how to operate correctly. It is same as an application expert from Gilson France sitting in front of you and demonstrating you how to use and maintain each products correctly and efficiently. Please click the picture on the right to see how nicely and instantly it works. After that please feel free to call us once you want to test the product practically from our ready stock in Jakarta. We also have printed version, call us in case if you wish to have one. Just "CLICK" on this picture to see Gilson 2014/2015 Electronic Catalog with full of new products. We delivered on 8th June 2015 to PT Cheil Jedang located in Pasuruan, Gilson Minipulse MP3, R1 Heads 2 sets along with 2 Power Supply Parts after 4 sets of MP3 with R1 Head. This company already have now 20 sets of Gilson MP-3.We thank to PT Cheil Jedang's management for their continuous trust on Siberhegindo Teknik. 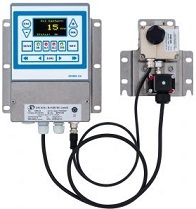 Gilson's MINIPULS® 3 is a peristaltic pump specifically designed to meet process laboratory liquid handling needs. The MINIPULS 3 peristaltic pump combines microprocessor speed control with a high-torque stepper motor. Chemical-resistant pump heads, equipped with 10 stainless steel rollers, set the performance standard in producing smooth, low-pulse flow and reproducible flow rates at higher pressures. The MINIPULS 3 is a rugged peristaltic pump with interchangeable heads for delivering smooth, low pulse flows of biological and chemical fluids in 1, 2, 4, or 8 channel standard flow rate and 2 or 4 channel high flow rate configurations. Please contact Mr. Win, or Ms. Farida if you want to know more details. OR click "Ready Stock" to see all our Gilson Products ready stock. Siberhegindo now keeps complete set of stock (Transformer, Power Inlet Assembly, Main PCB and Display) for Gilson Minipulse MP3 because of growing customers and population. PT Indorama Synthetics (IRS) backlog orders are shipped out in January to July 2015 for Indorama Polychem Indonesia /CP-4 project. IRS is the biggest Polyester Filament Yarns & Fibers manufacturer in Indonesia. IRS uses all sizes of Maag Gear Pumps in Indonesia as well as its sister companies in India and Thailand. Indorama group is today one of the top PET manufacturer in the world with 10 (Ten) branches also located in USA, UK and Eastern Europe. PT Siberhegindo Teknik together with Maag Pump Systems are always proud to be the routine supplier of Gear Pumps and Spare Parts to IRS since 1995. We thank to IRS management for their continuous trust. Due to production increase IRS has replaced Maag Vacorex 180 with Vacorex 224 MR and Vacorex 280 MR Pumps which are capable to produce 300 ton and 500 ton per day respectively. Maag Pumps run for 24 hours a day non stop for couple of years. Almost all of Maag Pumps in Indonesia PET factories are running for more than 15 to 20 years without any troubles. 90% of Polyester Plants in Indonesia use MPS pumps. In 2011, Indorama group acquired SK Keris & Polypet (all use our MAAG Gear Pumps) under the name PT. Indorama Ventures. Siberhegindo and MPS Singapore are always working very closely with all IRS companies. Due to frequent demand we are going to keep in June 2015 ready stock of Simultant Separating Chambers which are commonly used to wash TLC-plates before use and then to store them in protected manner. This procedure is used in particular for quantitative trace analysis. The verticular grooves in the transverse wall will hold five 200 x 200 mm TLC-plates. 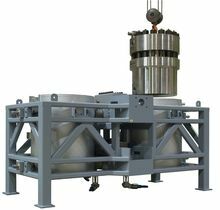 Specific features of this separating chamber are its plain ground flange edge and the flat chamber floor. The glass-lid can be used for covering during prewash of TLC-plates. Please call Ms. Farida Win, who has been trained for more details. 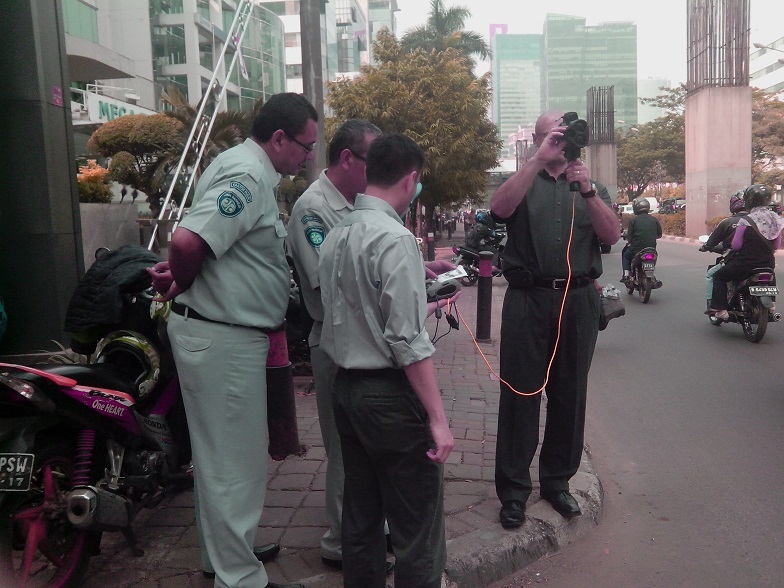 We are glad to announce that on 24th April 2015 we again sold one more Laser Technology USA TruCAM Laser Speed Detector for Jakarta Toll Road & Highway Traffic Police. This is second unit in 2015 alone. 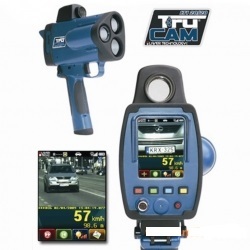 TruCAM is an integrated laser with a digital video camera, making the LTI 20/20 TruCAM the most sophisticated speed enforcement tool available today. It is the only all-in-one handheld laser-based video and photo camera on the market. The TruCAM collects and stores a complete chain of video evidence for both speeding and tailgating, along with a high-resolution image that identifies vehicle make, model and license plate number and facial characteristics of the driver. By utilizing GPS, it automatically generates location-based information every time the TruCAM is used. This provides managers with historical data to determine why, where, when and how to deploy valuable human and capital assets in the future. Please call our Mr. Tri Wardhana or Ommar Win for more details and to see demo units. 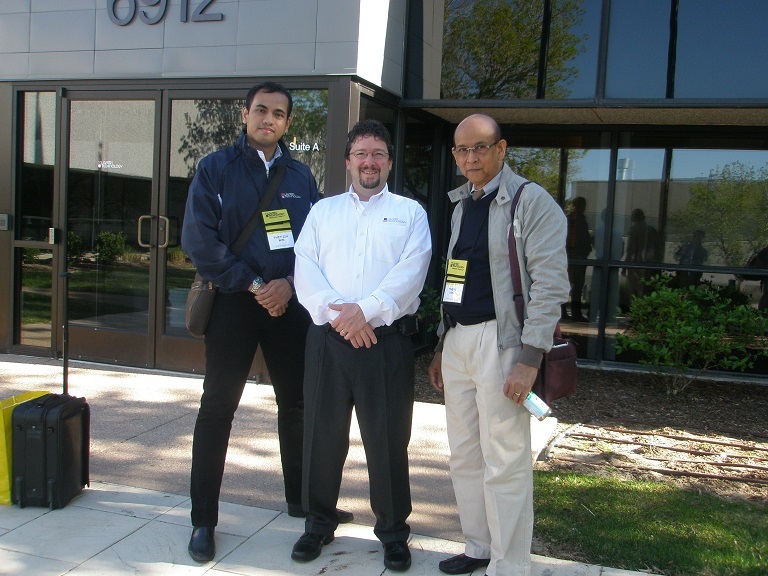 Siberhegindo Marketing Executive Ommar Win has attended Traffic Safety products Operation and Service Training at the Laser Technology Inc. Head Quarter in Denver, Colorado, USA on 26-30 April 2015. LTI products sales had exceeded our target in 2014 and it is important for Siberhegindo to stay close with LTI, USA. 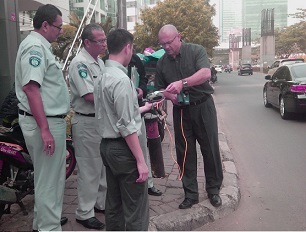 Siberhegindo Teknik is appointed to sell Solar Powered Lighting Systems and Light Kits in Jakarta since 5th April 2012. We all know that our present dependence on Petrol and Coal powered Electricity is getting more and more expensive day after day. 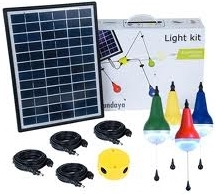 Sundaya light kits are powered by Solar Panel, easy to install and no need to worry for monthly bill payment. It is maintenance free. All you need is "SUN LIGHT". 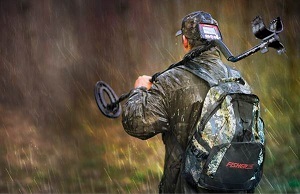 You can hand carry complete systems where ever you go. You can use at home, put in your car and carry around and use at camps, boats, etc. It is the best "donations" that you can give to poor families, schools, students, hospitals, worshiping places in remote areas where there is no electricity. 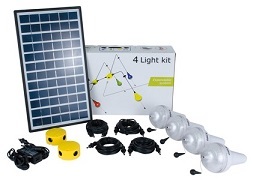 The Light kits come with One Light, Two Lights, Three Lights and Four Lights together with respective Solar panels and connecting wires and pole. Please call Ommar Win and come and see ready stocks at our show room and buy straight away. It is cheap. Very safe and very easy to use. You do not have to pay "Monthly Bill". 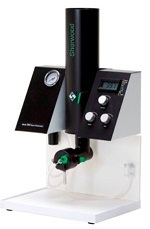 The Gilson Safe Aspiration Station is a stand-alone vacuum system that incorporates all the essential characteristics to aspirate quickly and safely all kinds of liquids in a laboratory and collect them in a 4 liter polypropylene bottle. A separate kit comprised of an aspi ration-handle and a set of adaptors is also available for users seeking a simple solution to improve their comfort and productivity.